For some kids, even the fully-grown ones, a teddy bear is the most comforting thing in the world! Of all of Earth’s species, bears have become the go-to animal if you need a cuddle. If this video is anything to go by, it appears that it’s not just humans who need the occasional hug. Goska captured this mother and her cub embracing moments before settling down for a nap together, entwined in each other’s paws. These bears are from Poland, and their video comes courtesy of Goska Zdziechowska – you may remember her as the Cheetah Experience volunteer with a jealousy-inducing friendship with a cheetah. Goska films the pair throughout some feeding and playtime, including the point at which mama bear gets kind of annoyed with the baby, and sort of just falls asleep mid-snuggle session, which every mother out there can probably relate to. 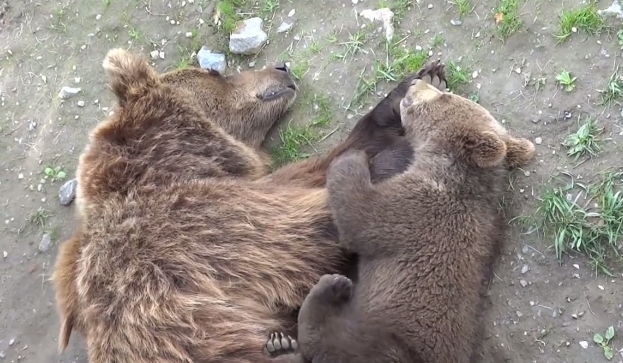 Responses to " Cutest Bears: Baby Bear Falls Asleep in His Mother's Arms "